Walter Benjamin is one of the most important intellectuals of the twentieth century. He has had a global influence in different areas of the humanities, with works that have become an unquestionable reference in the history of the ideas of the twentieth century. The main axes of his thought were aesthetics, literature, theory of modernity and the problem of the historical memory. This exhibition, which can be seen from June 18th to September at the Museum of Jewish History, is a tribute to this famous German thinker in the 75th anniversary of his death. He leaved in exile in Paris since 1933, and was arrested by the Franco's government when illegally he arrived at Portbou in September 1940. There, he committed suicide at the threat of being extradited back to France. "Walter Benjamin. Constellations of exile" proposes a reconstruction of the life and exile of Benjamin, to his tragic end, through witnesses and documents of various personalities around his environment that shapes his personnel and intellectual constellation. 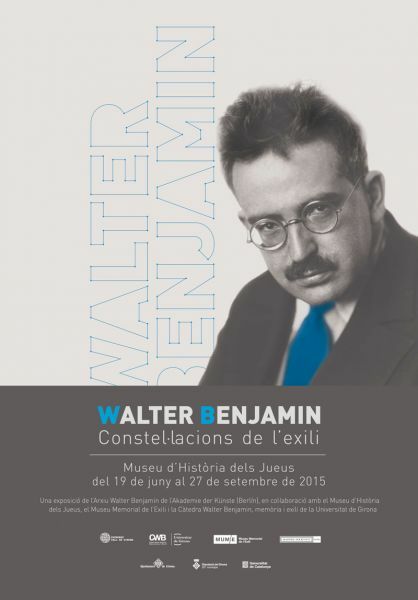 The exhibition is organized by the Patronat Call de Girona and the Chair Walter Benjamin, Memory and Exile of the University of Girona, in collaboration with the Historical Archive of Girona, the Exile Memorial Museum (La Jonquera) and the Akademie der Künste (Berlin), where the Walter Benjamin's archives are deposited.